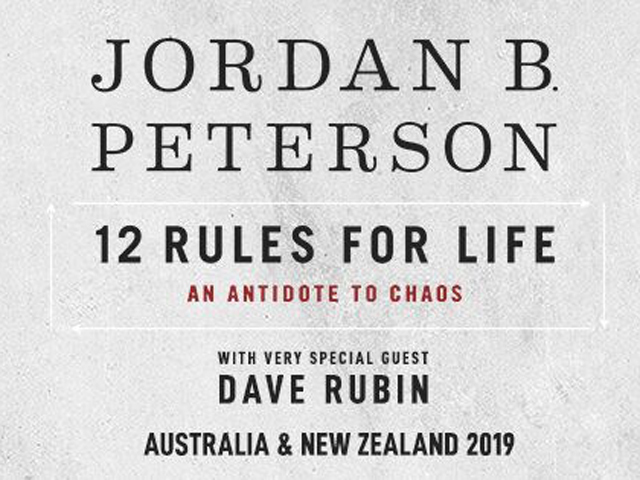 TEG Dainty and Nice Events are excited to announce that renowned professor, clinical psychologist and international bestselling author Dr. Jordan B Peterson will bring his 12 Rules for Life Tour to Australia & New Zealand in February 2019 with special guest Dave Rubin. The tour opens up in Perth on Saturday 9 February, and moves on to Adelaide on Monday 11 February, Melbourne on Wednesday 13 February, Canberra on Friday 15 February, Sydney on Saturday 16 February, Brisbane on Sunday 17 February and Auckland on Monday 18 February before winding up in Christchurch on Wednesday 20 February. Tickets go on sale at 12pm local time on Friday 30 November for the eight-city tour. Following sold out dates in 2018, the new show will expand on previous discussions and feature revolutionary talks on overcoming life's biggest obstacles, how to improve oneself, the psychology of religion, mythology, and much more. Dr. Jordan B. Peterson is a clinical psychologist, cultural critic, former Harvard Professor, and currently a professor at the University of Toronto. His main areas of study are the psychology of religion and ideological belief, and the assessment and improvement of personality and performance. Dr. Peterson has published over one hundred scientific papers, as well as authored Maps Of Meaning: The Architechture Of Belief and the bestselling 12 Rules For Life: An Antidote To Chaos (January 2018). At Harvard, he was nominated for the prestigious Levinson Teaching Prize, and has been regarded as one of three of University of Toronto's truly life changing professors. His classroom lectures on mythology and psychology were so well received that they were turned into a popular 13-part series on TVO. Dr. Peterson's YouTube channel has over 1.5 million subscribers, with videos averaging 1 million views and features his university and public lectures, responses to polarizing political crises of today and interviews with experts.